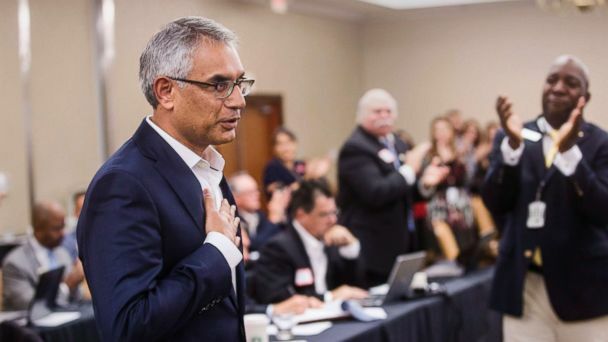 A regularly scheduled meeting for a county Republican party in Texas got national attention Thursday night as it held a vote over whether to remove a member of the leadership team because he's Muslim. "This vote reaffirms the commitment by a majority of Tarrant County Republicans to our core values and moral compass, a demonstration of our allegiance to the Texas Republican Party Platform and the Constitutions of the United States and Texas, which strictly prohibit religious and racial discrimination of any kind," Tarrant County Republican Party Chair Darl Easton said in a written statement provided to The Associated Press. Shafi told reporters outside the meeting following the vote, "As we struggled through the last few months, it would have been easy for me to quit, but I stayed on to fight. We were fighting for religious freedom ... and today we have come out victorious." Shafi was appointed to the role by the county GOP chairman in July and his appointment was overwhelmingly ratified by the group's precinct chairs, but Jeremy Bradford, the group's executive director, told ABC News that there was a vocal vote of dissent placed by Dorrie O'Brien. Bradford said that O'Brien later put forward the motion to have him removed from his position. "She has publicly said it is based on his faith and the fact that he's a Muslim," Bradford told ABC News. "We don't think he's suitable as a practicing Muslim to be vice chair because he'd be the representative for ALL Republicans in Tarrant County, and not ALL Republicans in Tarrant County think Islam is safe or acceptable in the U.S., in Tarrant County, and in the TCGOP," O'Brien recently posted on Facebook, according to the Ft. Worth Star-Telegram. "There are big questions surrounding exactly where Dr. Shafi's loyalties lie." O'Brien and Shafi did not return ABC News' requests for comment. The vote that will determine whether or not to remove Shafi will be held Thursday evening at the group's executive committee meeting, and "the vote will depend on who shows up." "I don't have a whip count," Bradford said. As for Shafi, Bradford described him as "a known commodity" who has been a part of the county GOP for 10 years. "He's a good person," Bradford said of Shafi. "He has a heart for reaching out to parts of our community that aren't typically part of the Republican fold." Shafi spoke to CNN in December, stressing that their party "has very specific rules that prohibit religious discrimination. Our country has specific rules and our constitution prohibits it." "So when this controversy arose because of a small number of people at the fringes of our party, it's been really very -- they're doing a disservice to our party," Shafi said to CNN. "Honestly it's frustrating," Bradford said of the attention that the vote has received. "We would very much like to be focused on raising money and getting ready for the presidential election cycle. This has been a major distraction for our party."